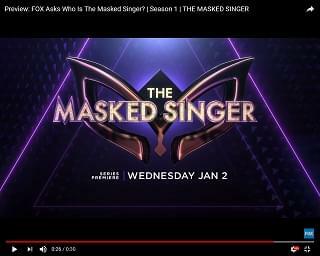 Last night was another installment of Fox’s new hit celebrity competition show, “The Masked Singer.” Once again, it was up to the audience and panel of all-star judges – Robin Thicke, Jenny McCarthy, Ken Jeong,and Nicole Scherzinger – to guess the true identities of the celebs in disguise. The Bee sang first, crooning “Wrecking Ball” by Miley Cyrus. Right off the bat, Robin guessed that she’s Gladys Knight. She could definitely hold a serious tune, so Jenny thought she could be Patti LaBelle. The Bee revealed that her mother gave her the idea to “form a group,” reminding us that she got her start in the 1950s. Ken guessed Anita Baker, and Nicole threw in Chaka Khan. And her item? Baking tools. Clue Review: Female, great voice, got her start in the 1950s, was inspired by her mom to start a group, considers herself an “empress,” her career has been “all peaches and marmalade,” may have been involved in a legal battle at one point, connection to baking tools. The Peacock was up next, belting out “All Of Me” by John Legend. His pipes really impressed the judges, and the way that he performed on stage had Jenny thinking he could be Donny Osmond. Meanwhile, Ken guessed Shaun Cassidy and Robin said Neil Patrick Harris. And while Nicole threw in Wayne Brady, she was still hung up on the idea of the Peacock being a professional magician because of his stage presence. Besides hinting that he feels lonely behind a mask that makes people not recognize him like he says they usually do, he brought a wig as his item, which he says he went to jail because of. Clue Review: Male, good performer, has performed in Vegas, started performing at a young age (possibly five years old), cast in dramatic roles, close with Michael Jackson, can sing, fear of heights, went to jail because of a wig. The Raven hit the stage next, singing “Brave” by Sara Bareilles. Her vocals proved that she’s probably not a professional singer, which Nicole pointed out. But Ken found something theatrical – or as he called it, “actor-y” – about her. Jenny threw in that she could be Sherri Shepherd, but after the Raven brought out an Emmy as a clue item, Nicole guessed Sheryl Underwood. Robin thought she could be Ricki Lake, or maybe Star Jones. Clue Review: Female, strong voice but not a professional singer. Recently lost a loved one – possibly a child, has made a career out of talking, possibly born in 1986, won or been nominated for an Emmy. Finally, the Monster hit the stage next, bringing down the house with his rendition of “American Woman” by Lenny Kravitz – Nicole was loving the performance. He revealed that he has had dark days, but is a fighter, so Jenny was thinking he could be an athlete. Ken guessed David Allen Grier, and Robin threw in Lil Rel and Tommy Davidson. His item was a headset, so Jenny switched her guess from athlete to sportscaster. Clue Review: Male, he has had dark times and been labeled a monster, strong voice but not known as a singer “to everyone,” possibly based in New York, involved in sports or comedy, connection to a headset. In the end, the one voted off for the unmasking was the Raven, and the judges threw in some of their last guesses before the big reveal. Robin stuck with Ricki Lake, Nicole threw in Raven Symone or Meghan McCain, and Ken guessed Sheryl Underwood. Robin was right to stick to his guns because the Raven was revealed as… Ricki Lake! That still leaves six more disguised celebs to uncover – behind the masks of the Rabbit, Alien, Bee, Lion, Monster, and Peacock. Who do you think they are?